But seriously, this book is exquisite. 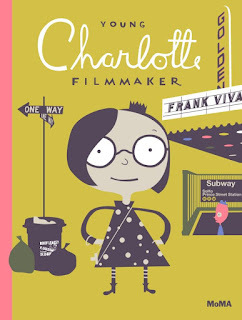 A longtime fan of Frank Viva's work, especially his quasi-bio creations, Young Charlotte Filmmaker is a book that will entrance children and cause any adult with even a fragment of a microcosm of creativity, to rush straight to the studio or the camera or the art shop or the typewriter or Bunnings, to begin creating. Charlotte is a filmmaker. She's never without her camera, but she has quite an interesting obsession. It's for black and white. Everything must be black and/or white, from Smudge the cat to the local nuns and penguins, it's B&W all the way. Others say she should love colour, but she quite simply doesn't. It's just the way she is. Colour gives her headaches. Sundays are Charlotte's favourite day because she gets to go to the Museum of Modern Art. On one visit, she meets an intriguing woman, dressed in black and white. The two quickly become friends, and Charlotte finds herself immersed in the fascinating world of the Museum's film department. Both Charlotte and her new friend Scarlet believe that film is art. Scarlet shows the young girl some incredible old movies--all in black and white, and Charlotte is inspired to create her own film which Scarlet insists on screening at MoMa. The premiere arrives and Charlotte is terrified. What will the public think of this young girl's starkly monochrome film? Should she bring the vibrancy of colour into her work, or should she follow her heart? This book is drenched in style, research, passion, intensity, freshness and artistic angst. It's modern yet retro, fandangled yet steeped in the past. Paying homage to the black and white films or yore and to the sometimes overwhelming flood of creativity we all experience, it won't fail to delight readers of all ages. Black pages astonishingly incorporate a mostly monochrome palette, using negative and positive space in truly impressive ways, with a sort of Picasso-like feel. Pops of colour puncture the paper on occasion, making it an absolute visual feast. All children should read this book. One of my favourite books of 2015, Charlotte is dedicated to Jytte Jensen, Curator of the Department of Film at MoMA from 1982 to 2015.